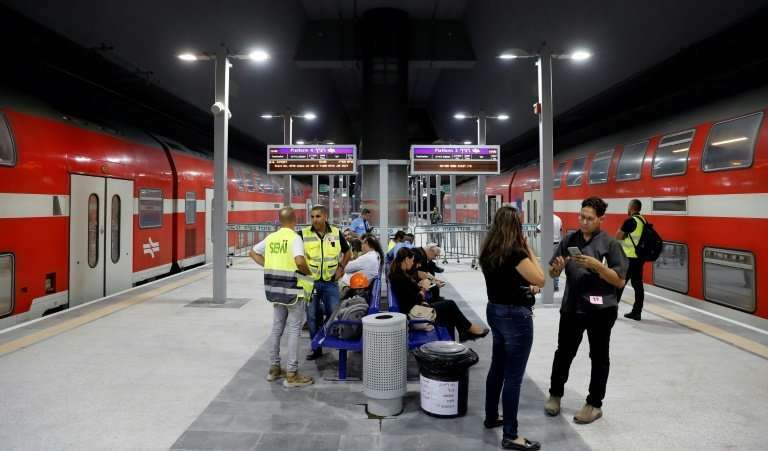 Israelis climbed aboard the country's new high-speed train on Tuesday as it partially opened to whisk passengers from Jerusalem to Ben Gurion airport, a massive project years in the making. A smattering of passengers descended into the new station 80 metres (260 feet) underground in central Jerusalem for the first train at 6:32 am, and some of them weren't actually travelling anywhere. They included Richard Elkaim, who boarded the red double-decker carriages with his wife and three of his grandchildren to test out the new line—then ride back home to Jerusalem. He and his wife pulled out their mobile phones to record their grandchildren—11, 7 and 6—as the train left a tunnel to follow an elevated route through the steep hills and valleys surrounding Jerusalem. "It's because we have waited for years, this network for more than 10 years," said the 71-year-old retired doctor originally from France. "For everyone who works, for all Israelis proud of their country, it's incredible." The train will eventually connect Jerusalem to the commercial capital Tel Aviv with a high-speed link that will take only 28 minutes. It is capable of travelling at 160 kilometres per hour (100 miles per hour). In normal traffic, it can take around double the amount of time to drive, but congestion in the Tel Aviv area can be maddening and lead to longer commutes. For now, the train is only running as far as Ben Gurion airport from Jerusalem, with the link onward to Tel Aviv not yet complete. No timetable has been set for when that will open. It is running as a pilot programme for the first three months at no charge to passengers, though they must first reserve a voucher online for the 21-minute trip. Only 400 passengers are allowed to board each train for now compared to around three times that when it begins full operations. The new line was due to open in March, but work to prepare it has been slower than expected. The 6.5 billion shekel ($1.8 billion, 1.5 billion euro) project had already been pushed back multiple times over the years, with a 2008 opening having originally been set under an earlier work programme. But for Israelis on the train on Tuesday, seeing it in motion was good news even if it is only partially open. 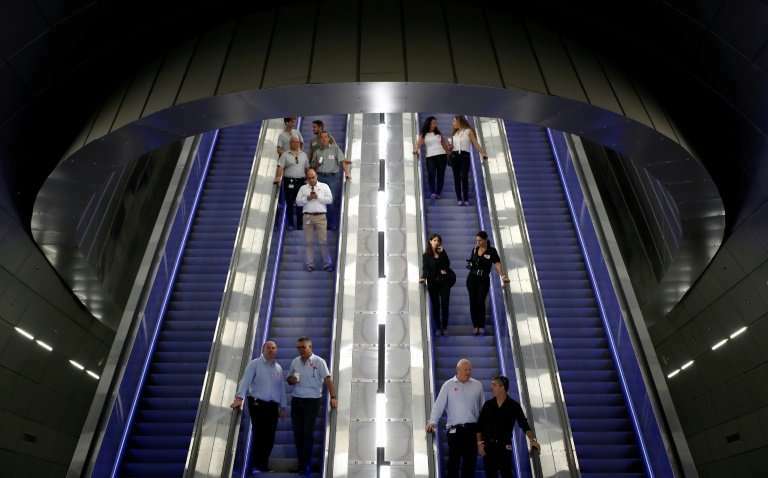 "Listen, it's 6:30 in the morning," said David Gold, a 20-year-old Jewish religious student in Jerusalem as he readied to take the escalator down into the station. "I was ready for this, I don't know, like two years already." The train has not come without controversy linked to the Israeli-Palestinian conflict since part of the line passes through the occupied West Bank. Saeb Erekat, secretary general of the Palestine Liberation Organisation, said: "Israel is illegally making use of occupied Palestinian land." Israel also wants to extend the line to include a Western Wall station in annexed east Jerusalem, which would be sure to spark further criticism. For Israelis, the project is a realisation of a longer-term vision to connect the country by high-speed rail. 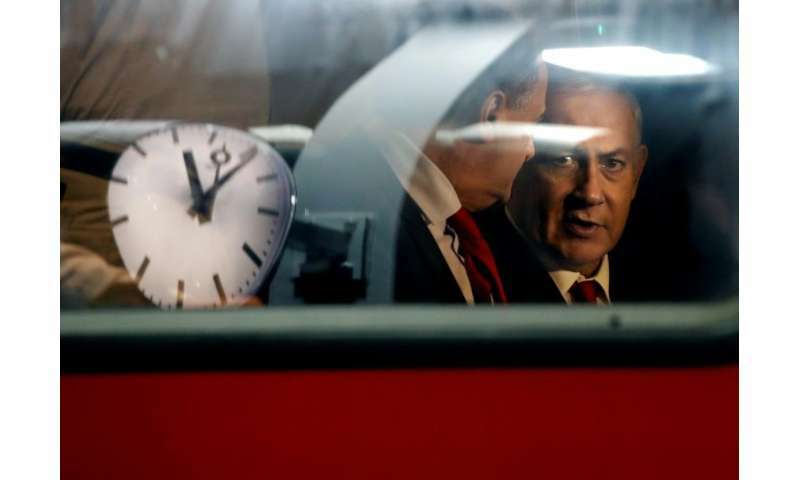 Prime Minister Benjamin Netanyahu and Transport Minister Yisrael Katz took a test ride on the train last week to showcase one of the government's marquee projects. Foreign companies involved in the project include Canada's Bombardier, Spain's Semi and France's Alstom. It includes 40 kilometres (25 miles) of tunnels and eight bridges. Shay Nachum, a 45-year-old mechanic who was also taking the train to test it out, said the delays meant it was "not perfect, but I'm an optimistic guy. I see the good (in things). "And it works, it's good. Finally. It took a lot of time, like a lot of Israeli projects, but now it works and it's good."